With long winter nights, we all enjoy a little sparkle. 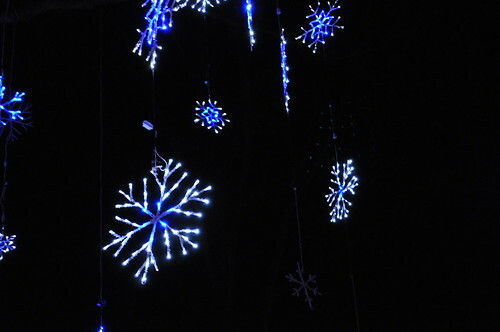 Christmas is the focus of most light displays at this time of year, but there are at least two impressive shows whose focus is primarily nature, not holidays. Any others we should know about? Brookside Gardens in Wheaton, MD offers their Garden of Lights from 5:30 to 9:00 most nights through January 3 (not December 24 or 25).This huge display has hundreds of flowers, trees, animals (including a persimmon-eating giraffe and a walk-through caterpillar tunnel), topped by a delightful rainbow with rain clouds and lightning. This video from Washington Gardener gives a feel for part of the display. They've also got a toy train running through the conservatory, and live music every night in the visitor's center. Although this is a walk-through display, admission is per-car: $15/car Mon-Thur and $20/car Fri-Sun (cash only). At the National Zoo, ZooLights not only offers thousands of sparkling lights in animal-themed displays, but also keeps some of the animal houses open into the evening, and offers puppet shows and other entertainment. Their website has a slideshow from the 2008 display. 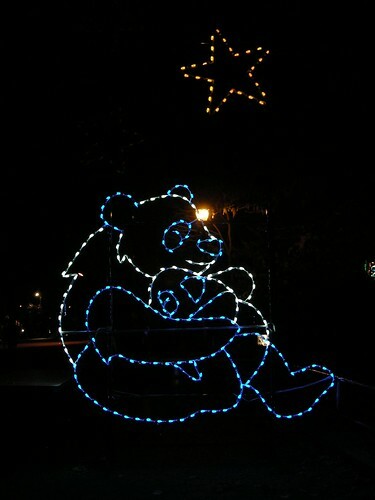 Starting Friday, ZooLights will be open from 6:00 to 8:30 most nights, through January 2 (not December 24, 25, and 31). Tickets are $8 per person at the Zoo ($5 for FONZ members) or you can order ahead through Ticketmaster for an additional $3 per ticket. Free for military families on many nights. As always, we've got a full calendar of group hikes and other activities going on this week in parks around the DC area. We'll see you out there!